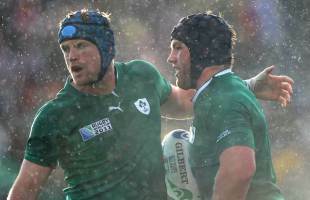 The dust had barely settled on Ireland's 62-12 demolition of Russia before Declan Kidney turned his attention to next Sunday's critical World Cup clash with Italy. Even though the Irish top Pool C, three points clear of second-placed Australia, they know defeat to the Azzurri in Dunedin could dump them out of the tournament. After their heroics against the Wallabies, failing to reach the knockout stages would be an unbearable conclusion to a World Cup that has promised so much. The inability to secure the try-scoring bonus point against the United States could yet prove decisive. Head coach Kidney said: "Australia was the big game everyone was talking about, but we always knew in the background that beating Italy would be vital for us to get out of the group. "Because of the points structure we had to pick up maximum points in our first three games in order to be guaranteed to get out of the group at this stage. The fact we're in a winner-takes-all situation makes it like a cup final with a big prize to play for in getting into the quarter-finals. "We know that we could be going home on the plane the following day too. We're under no illusions about the task ahead of us." The last time Ireland lost to Italy was in 1997, so defeat in Dunedin is unlikely no matter how seismic the potential consequences are. The quarter-finals certainly moved a stepped closer after Russia conceded nine tries in a predictably one-sided contest at Rotorua International Stadium. Keith Earls led the charge with two tries, with Fergus McFadden, Sean O'Brien, Isaac Boss, Andrew Trimble, Rob Kearney, Shane Jennings and Tony Buckley also breaching the whitewash. Man of the match Ronan O'Gara kicked a penalty and six conversions to finish with 15 points, missing just one shot at goal, and made good use of the space given to him by Russia. It was a comprehensive victory over Pool C's whipping boys, but Kidney was not entirely convinced. "We had hot and cold patches. We started off well in both halves but also probably fell off in the middle of both halves," he said. "There were plenty of good things but obviously plenty to work on as well. Sometimes we didn't have the team cohesion that we wanted, but it wasn't down to lack of effort or anything like that." Ireland fielded a mixture of first and second string players led by Leo Cullen, who was making his World Cup debut. The bonus point arrived shortly before the break, but Russia offered spirited resistance at times with Vasily Artemyev and Denis Simplikevich scoring second-half tries. "For the most part we're pretty happy. Scoring nine tries in a World Cup game is a pretty good achievement," said Cullen. "There were patches of the game that weren't ideal and conditions out there were reasonably tough, the ball was greasy. "Russia acquitted themselves pretty well and had some good back-rowers and a lot of pace in the back three. They made life difficult for us and will get stronger the more games they play at this level. It was an education for us at times. "We maybe forced things too much at times but we can move from here on satisfied. We talked about carrying on the momentum created by beating Australia and we've done that. Overall we're happy."